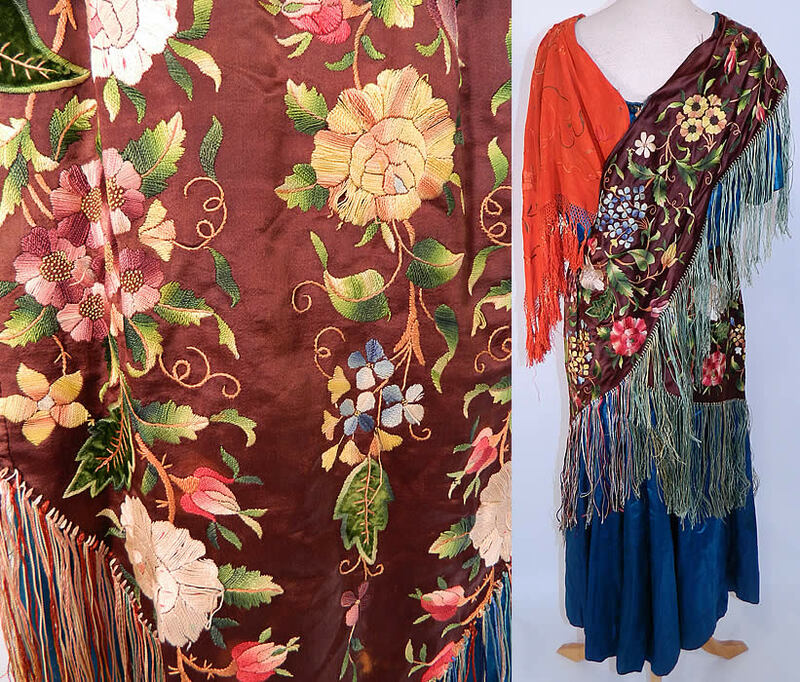 This vintage antique silk embroidered floral fringe piano shawl boho dress dates from the 1920s. 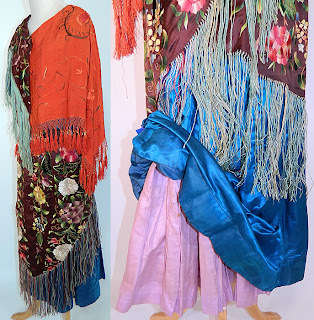 It is made of a variety of colorful silk embroidered fringed antique piano shawls, layered and sewn together into a patchwork style. There is a orange and a brown silk shawl with raised padded satin stitch embroidery work and French knots done in a floral vine leaf design. 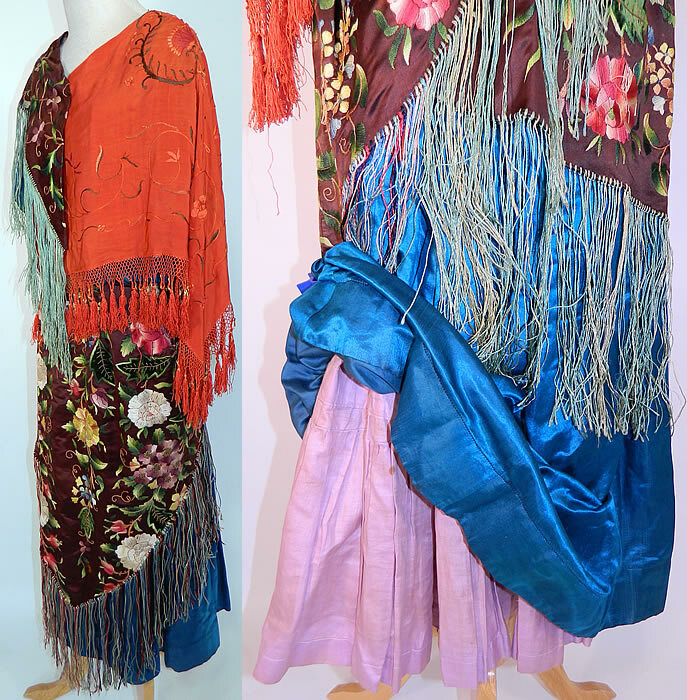 This exquisitely embroidered custom made bohemian gypsy dress has a blue silk underdress, with short sleeves, covered with the embroidered shawl fabric, fully lined, with a lilac cotton petticoat skirt underneath for added fullness and hook closures down the back. The dress measures 46 inches long, with 42 inch hips, a 34 inch waist, 36 inch bust and 16 inch back. 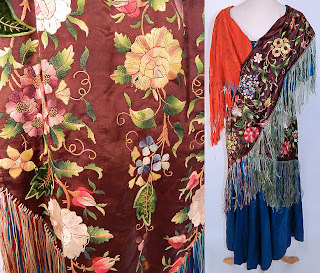 It is in good wearable condition, with only some faint underarm discoloration and a tiny pin hole, repair on the shoulder. 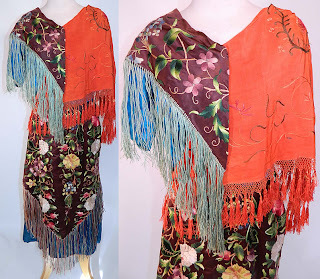 This is truly a rare unique piece of wearable boho embroidery textile art!